Piedmont Park Seventh- Day Adventist Church was established in 1886 in Lincoln, Nebraska, with 40 members. Today, the congregation totals 620 members. Pastor Michael Halfhill has led the faith community since 2001. Piedmont Park hosts Bible study classes and supports local school activities and volunteer efforts. The staff at Piedmont Park Seventh-Day Adventist Church in Lincoln, Nebraska used to spend hours printing, folding and stapling their weekly bulletin. With a congregation of 620 members, pastor Michael Halfhill and his secretary needed more efficient methods. When his trusted Technology Advisor presented the Konica Minolta C458, Halfhill knew he found the solution. The machine prints 45 pages per minute, features automatic stapling and folding, scan to email and digital storage of documents, among other features. “It takes care of all of our needs,” Halfhill said. At highest volume, the church prints 12,000 copies per month. They print bulletins, flyers, programs, activity pages, advertisements, etc. Halfhill appreciates the ease of printing from their office. “In the past, we’ve had to outsource, go to Kinkos or VistaPrint, and we are able to do a lot more in-house now, which is just quicker, more efficient and more cost-effective.” Increasing productivity helped the church deliver more outreach materials, such as flyers for vacation Bible school or special events. Price was also a large factor when Halfhill decided on the Konica Minolta. His Technology Advisor introduced the non-profit to Sourcewell special pricing. “It was actually going to give us some savings if we went this route. It was easily explained that we would have savings and better-quality equipment.” Plus, the church now saves nearly 32% per month on printing costs. The first time Halfhill tested the product, he was amazed at the quality. “We printed with this new machine, and both my sales rep and I were like ‘wow’ look how clear and sharp it looks.” He noticed an improvement in quality printing, speed and convenience instantly. With congregation members easily accessing the copier, Halfhill feels thankful for the intuitive, simple design as well. “The ease of use has been wonderful. Church members will come in and need something printed or copied. I needed that to be easy to not have to train everybody every time on how to do it”. Halfhill and his secretary don’t spend time coaching members on the copier’s functions, as the machine requires little training. 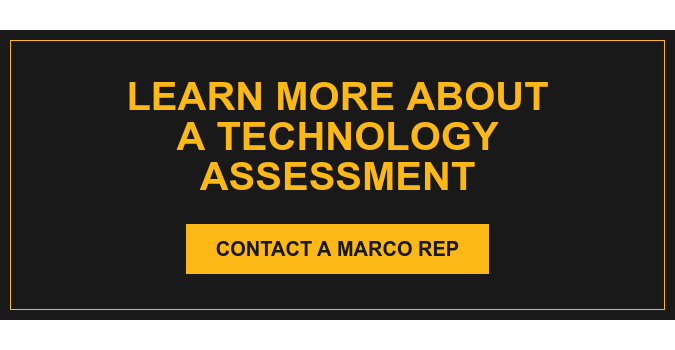 Though it happens rarely, when issues with their copier arise, Marco is ready to assist. “I would give them a 10 out of 10 because we have never had any issues that could never be resolved quickly or to our satisfaction,” Halfhill said. For instance, when he contacted Marco to connect his laptop to the copier, they accessed his device remotely and finished the installation within minutes. Since switching to Marco’s product about a year ago, Halfhill has been satisfied. “Marco... figures out your needs, what you’re looking for, and then matches you to a product. I easily recommend them for price, access, availability and knowledge.” As the church grows, Halfhill plans to contact Marco for any further technology needs.